We landed in Bangkok this morning to make if officially half-way around the world. We are fully 12 hours ahead of home in Kansas City. We found a “First Class” line for immigration, only to realize that this was actually a special pass, but she let us through anyway, since there was no one else behind us. 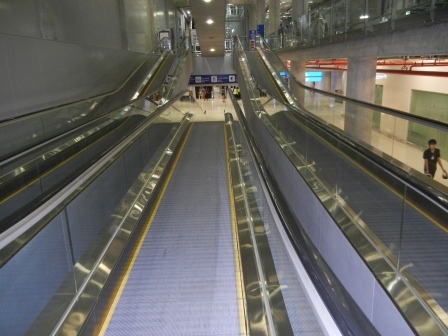 We found the Airport Express line and went through about 20 different moving sidewalks, including ones that worked like ramps. It was a little bit of a crazy feeling when the angle changes underneath your feet. After getting the token for the City Line from the airport we got onto our first public transportation since Berlin, and were both really happy about that. The City Line doesn’t play any music and is VERY quiet. It is almost eerily quiet even when almost completely full. Once we got to the end of that line, we got to the SkyTrain BTS Station. The people in front of us had a very hard time using the kiosks, but Earl and I managed to get our tickets and get to the Grand Hyatt Erawan Bangkok, hot but unscathed. We were then led to the 17th floor in order to check in early and grabbed some much needed soft drinks. We were grateful to have good signage! Something that we sorely missed in Turkey and Egypt. Next stop was a shower and a nap for me, Earl didn’t sleep well on the flight, so he wanted to stay up and get adjusted and explore a little bit. So I slept until about 1 and then we got up and attempted bathing suit shopping. Thailand is a shoppers paradise, but it can be confusing. So, we went to the first mall and I found a store with bathing suits, but then I put it on and it looked ridiculous on an American girl frame. So, she said to do to “Pixie” is what we heard, then we asked someone else where Pixie was and they had no idea, so we just kept walking. Then I saw a place called, Big C. This looked like a huge department store like Walmart or Target that would have everything. So, we went up the fancy escalators they had there to the clothes. And found the rack of bathing suits. I kept looking around and was looking at the XLs, and then we got a Thai helper and she kept pulling out the 2XLs with ruffles….(Ack! ), so I finally settled on a 2XL boring bathing suit, but it will work for playing with the elephants. 🙂 Then of course we had the epiphany that this was “Big C” which was the store that the original shop girl suggested. Earl and I also got some of the other things were were looking for and got a snack at “Mr. Bun” which was great, but not filling so I grabbed a cheeseburger and fries from McDonalds. 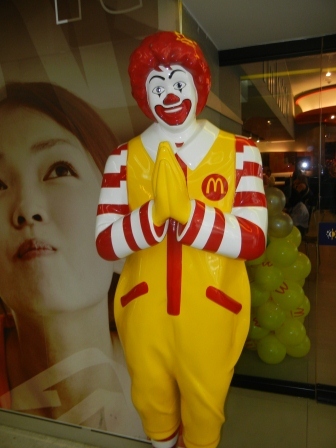 And even Ronald McDonald gets to “Wai”, which is the Thai bowing greeting. By about 4:30, Earl was ready to crash for his afternoon rest to catch up on his lack of sleep on the flight, so we slept again from 4:30 to about 8:30. Then grabbed dinner, which was great and we were glad to have an option that wasn’t hummus or lamb. Alarm is set at 4:15 AM for a very exciting day from Bangkok Day Tours! We have breakfast with the elephants and afternoon at the Tiger Temple! Thanks – Enjoyed this blog post, is there any way I can receive an email every time you publish a fresh post? There is a checkbox at the bottom of each post to receive email for each new post. Thanks!